This photo illustration shows a Vietnamese cryptocurrency investor looking at the latest Bitcoin values on a smartphone in Hanoi on 12 April 2018. Vietnam’s strong economic growth in recent years has led to the flourishing of the nation’s digital economy. The country’s economy in 2017 was deemed to be one of the best performing in the region. Its economy saw a 6.8 percent increase in gross domestic product (GDP) – higher than the government’s initial target of 6.7 percent – making it one of the fastest growing economies in Southeast Asia. Meanwhile, the growth of the middle class and the growing number of internet users as a result of such rapid economic growth has spurred on the digital economy. Vietnam currently has 54 percent of its population on the internet and the number is expected to grow further in the coming years. The government there has also outlined plans to consolidate the growth of the digital economy by introducing various initiatives. Vietnamese Prime Minister Nguyen Xuan Phuc told the audience at Smart Industry World 2017 that his government will invest in modernising the national information infrastructure system and connectivity while developing smart industry based on digital technology. With such potential in its digital economy combined with bright economic prospects, it is no wonder Vietnam is quickly becoming a hub for fintech start-ups. Data from Vietnam Briefing shows that 39,580 start-ups entered the Vietnamese market in just the first four months of 2017, a 14 percent increase from the first quarter of 2016. Within the start-up scene, the fintech sector has become the most attractive for investments, receiving US$129 million in investments in 2016. Over the past couple of years, the fintech ecosystem in Vietnam has advanced quickly. The fintech scene in Vietnam is diverse too, as start-ups there focus on all areas of fintech ranging from peer-to-peer lending and credit scoring to mobile payments and more. 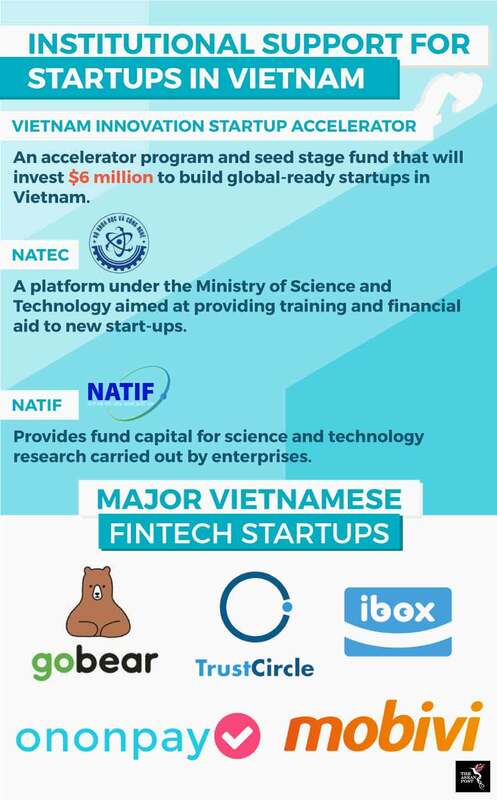 One reason why Vietnam has become such fertile ground for fintech start-ups is due to the government’s support in helping to foster it. In 2016, the government established the National Agency for Technology, Entrepreneurship and Commercialisation Development (NATEC). NATEC is a platform under the Ministry of Science and Technology which aims to provide training, mentorship, business incubation and acceleration and financial aid to new start-ups. The government also has special tax schemes for start-ups under certain conditions. It will provide corporate income tax breaks for companies working in the high technology sector or in high-tech zones. The preferential tax rates are 10 percent for 15 years or 17 percent for 10 years, as opposed to the regular rate of 20 percent. Furthermore, there are also various accelerator programmes in the country giving assistance to start-ups. For instance, the Vietnam Innovative Startup Accelerator (VIISA) invests US$6million in start-ups to help build global companies in Vietnam. The institutional support given to start-ups has led to the flourishing of many local fintech firms. As a result of this, investments from all over the world are pouring into Vietnamese fintech firms. Last year, it was reported that Vietnamese mobile app developer Appota secured an undisclosed sum from two prominent investment funds in South Korea – Korea Investment Partners (KIP) and Mirae Asset Venture Investment, bringing its total funding then to nearly US$10 million.. The investment will be used to jumpstart the next stage in Appota’s foray into fintech. Even global fintech players such as Alibaba are tapping into the popularity of fintech in Vietnam. Samsung Pay entered the market last September following an agreement with the National Payment Corporation of Vietnam (NAPAS). Not long after, Alibaba signed a Memorandum of Understanding (MoU) with NAPAS in April to enable Chinese tourists to use Alipay when traveling across Vietnam. According to the agreement, Chinese travellers will be able to use Alipay throughout Vietnam via NAPAS member banks and its intermediary payment service networks. Vietnam has come a long way, evolving from an agrarian based economy to one that now probably has the most exciting fintech scene in the region. It hasn’t even reached its full potential yet. For that to happen, the government there needs to extend its full support to it moving forward. The future is anyone’s guess, but maybe one day we’ll see Hanoi emerging as the region’s Silicon Valley.